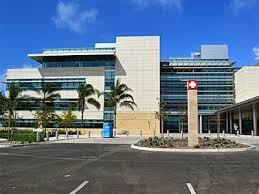 Completed naval hospital at Camp Pendleton. Photo courtesy Clark Construction. A ribbon-cutting ceremony marked the official opening of the newest Navy Medicine West facility, Naval Hospital Camp Pendleton, Jan. 31. The 500,000 square-foot, four story building was delivered six months early and more than $100 million under budget. NHCP Commanding Officer Capt. Mark A. Kobelja welcomed everyone to the 1 p.m. ceremony and thanked all the personnel responsible for the new facility. The official party consisted of Principal Deputy Under Secretary of Defense Comptroller) Mike McCord, Assistant Secretary of Defense (Health Affairs) Jonathan Woodson, Commanding General I Marine Expeditionary Force Lt. Gen. John Toolan, Deputy Surgeon General of the Navy, Deputy Chief of the Navy’s Bureau of Medicine and Surgery Rear Adm. C. Forrest Faison III, Richard Heim, president and CEO western region, Clark Construction Group, CA, Commander, Navy Medicine West, Naval Medical Center San Diego Rear Adm. Bruce L. Gillingham and Commander, Naval Facilities Engineering Command Atlantic Rear Adm. Douglas G. Morton. McCord emphasized that this project was more than only the second largest project from the American Recovery and Reinvestment Act of 2009 as it means so much to care for the men and women who put their lives in harms way every day. Toolan thanked all those who made this hospital possible and in such a short period of time. Situated on a 70-acre site near the main gate of Marine Corps Base Camp Pendleton, the new Naval Hospital will employ a staff of around 2,400 physicians, nurses, and support personnel who will serve around 157,000 military healthcare beneficiaries.